"Queen María of Castile, wife of Alfonso V, 'the Magnanimous,' king of the Crown of Aragon, governed Catalunya in the mid-fifteenth century while her husband conquered and governed the kingdom of Naples. For twenty-six years, she maintained a royal court and council separate from and roughly equivalent to those of Alfonso in Naples. Such legitimately sanctioned political authority is remarkable given that she ruled not as queen in her own right but rather as Lieutenant General of Catalunya with powers equivalent to the king's. María does not fit conventional images of a queen as wife and mother; indeed, she had no children and so never served as queen-regent for any royal heirs in their minorities or exercised a queen-mother's privilege to act as diplomat when arranging the marriages of her children and grandchildren. But she was clearly more than just a wife offering advice: she embodied the king's personal authority and was second only to the king himself. She was his alter ego, the other royal body fully empowered to govern. For a medieval queen, this official form of corulership, combining exalted royal status with official political appointment, was rare and striking. The King's Other Body is both a biography of María and an analysis of her political partnership with Alfonso. María's long, busy tenure as lieutenant prompts a reconsideration of long-held notions of power, statecraft, personalities, and institutions. It is also a study of the institution of monarchy and a theoretical reconsideration of the operations of gender within it. 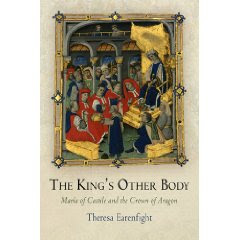 If the practice of monarchy is conventionally understood as strictly a man's job, María's reign presents a compelling argument for a more complex model, one attentive to the dynamic relationship of queenship and kingship and the circumstances and theories that shaped the institution she inhabited." I am totally lost on the Family Tree of Castile and Aragon!! TOTALLY!! There is a chart as to the lineage of the Castilian and Leonese royalty House of Trastámara HERE, but it's not a simple father to son etc thing. It shows on that chart at the end of the line of the 'House' is our favorite Joanna/Juana the Mad, who we learned about during the C.W. Gortner blog tour. Maria is a couple generations removed from Juana and her sister Catherine of Aragon (Queen of England). The book in question is about Maria of Castile (1401-1458) who was a daughter of Henry III of Castile and Catherine of Lancaster. In doing the Google Thing, there is not a whole bunch of information on this Maria. So it will be interesting to see how this book reads, is it a book that leans more towards the politics of Aragon/Castile, or of the nature of the person of Maria. Maria is also known as Queen of Aragon, Valencia, Sicily and Naples. Her paternal grandparents were John I of Castile and his first wife Eleanor of Aragon. Her maternal grandparents were John of Gaunt, 1st Duke of Lancaster (where he has many descendants it seems, as I've seen his name gazillion times as an ancestor was trying to prove his or her royal worth) and his second wife Constance of Castile (1354-1394). Maria was betrothed to Alfonso V of Aragon in Valladolid in 1408; the marriage was celebrated in Valencia during 1415. Maria had delicate health, and was said to be unattractive. During Alfonso's wars in Italy, she acted as a regent in Aragon. Alfonso and Maria failed to produce children. She was buried in the convent of the Trinidad in Valencia. Her brother, John II, was King of Castile from 1406 to 1454. Have you read this far? Confused? Anyway, the Castilian/Aragonese Royalty still fascinate and at some point I will find that perfect family tree where all Kings and Queens of Europe are easily distinguished. Suggestions of links welcome.